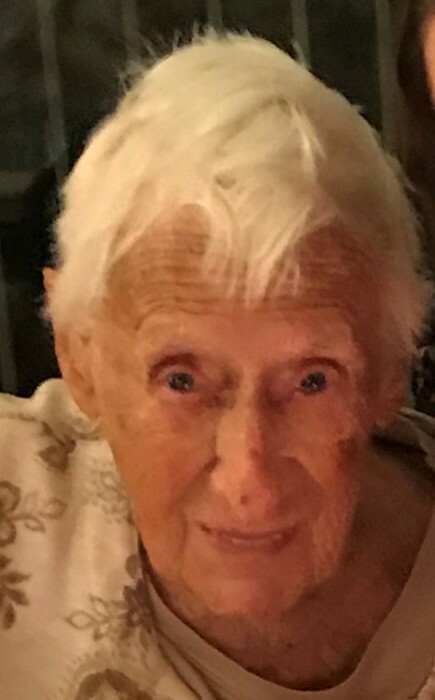 Helen Cecilia (Dabkiewicz) O’Leary, age 99, died April 1, 2019 in Jackson, Wyoming. She lived a long and adventurous life. Helen was born March 8, 1920 in Evanston, Illinois to Vincent and Pauline (Wierniewski) Dabkiewicz; both her parents emigrated as children from Poland to the United States. She and her brother Ralph exercised polo ponies growing up, as her father worked as a chauffeur for the family of the Edward Hines Lumber Company. As a child her family lived in Illinois and Ohio. While working at a drug store in Evanston, Illinois she met Robert F. O’Leary, and they married in 1944. As newly married couple they lived in Evanston, while Robert was in the Navy. They had four children: Maureen, Paula, Charlie and Robert II. They moved to West Chicago, Illinois, where Robert was born, and his family lived. Helen had a real estate license, was a homemaker, scout leader, and did lots of activities with the children. After her husband’s brothers died, she and Robert helped their children. The house was always busy with neighbors and their children. Summers were spent at Glen Ayre Country Club, Lake Geneva, and Spooner Lake in Wisconsin. Helen and her husband and the children took winter trips to Orlando and New Smyrna Beach Florida, where Helen’s parents, brother and sister lived. Helen and her husband often traveled with family and friends. On a trip to England, Scotland and Ireland, Helen was surprised by Robert flying them over on the Concorde. Other trips included Jamaica, Baja, Hong Kong, Singapore, mainland China, and motor sailing around the San Juan Islands. They bought a house in Jackson, Wyoming in 1979 and came out several times a year with the rest of the family. When her husband retired, they moved to Racine WI, so he could sail his boat more. Then at age 67, Helen went to Nepal to trek with her daughter Maureen and 2 friends. They spent 20+ days hiking from Jiri to Namche Bazaar to Everest View Hotel. At 12,500 ft she had views of Mount Everest, Ama Dablam, and several other over 20,000 ft peaks. To practice for the trek, Helen stayed in Jackson most of summer and climbed up and down Snow King daily. In 1991 Helen and Robert went with their daughter Maureen and friends, on a 21-day private raft trip down the Grand Canyon of the Colorado. In 1996 Helen and Robert took all their children, spouses and grandchildren to Courchevel, France on a ski trip. Then visited Geneva and Lugano, Switzerland, Lake Como, Italy, and St. Moritz. They rode the Glacier Express train to Zermatt, taking gondolas to the top of the Little Matterhorn, followed by skiing at Verbier. Side trips were taken to Aosta, Italy and Chamonix where they took the tram up Mt. Blanc for lunch. The trip ended in Paris, visiting the Louvre, other art museums and mass at Notre Dame. After selling the sailboat, Helen and her husband moved to Jackson, Wyoming full time. They spent every winter in New Smyrna Beach, Florida. Maureen and friends took Helen on various trips: horse camping in the Wind River range, cross country skiing, winter camping to Pole Cat hot spring and snowmobiling from the Gros Venture road to the Darwin Ranch. She made “Mom’s trips” with her friends Muriel and June, horse camping up Crystal Creek and snowmobiling to the Darwin Ranch from Cora. At age 75, she wanted a horse. After a long search, her husband surprised her with Tukala, a 2-year-old buckskin Quarter Horse who she loved to ride in the mountains. Helen so enjoyed spending time with the grandchildren both in Illinois, Jackson and Florida. Several times she drove them to Jackson to spend part of summer or winter with her. Helen loved to take the grandchildren camping up Little Granite and Cliff creek using the trailer and bringing the dogs and horses. After her husband died, she took a 2-week road trip with her daughter Maureen and her two German Shepherds touring Oregon in a rented RV. Helen loved the dogs; we were never sure how much of her food she ate and how much the dogs got. Helen loved going to the cabin in Bondurant and sitting in the sun by the pond. She was so happy when Paula, Charlie and Robert II moved to Jackson because then she had all four of her children close. After watching all the helicopters on the Elk Refuge fighting the Horsethief Fire, she said she wanted to go on a helicopter ride. For her next birthday Charlie and Maureen arranged a flight with her over St. Augustine, Florida. She enjoyed it, but told them she really wanted a bigger helicopter to ride in. niece Ann Corder. She was also visited by her granddaughter, Erin and family friend Joe, who became her private chef. She loved sitting in the sun, listening to the waves and watching the ocean for dolphins and birds. She always came home with a super dark tan. Helen never stopped having fun. She was always ready for an adventure and loved to go out to dinner even at 99. Her favorite restaurant was El Abuelito’s. She was an INSPIRATION!. She was preceded in death by her parents; Robert, her husband of 61 years and her brother, Ralph. She is survived by all four children, and six grandchildren: Erin, Robert III, Aubrey, Mary Claire and Margaret Rose O’Leary, and Robert Boncela. Her sister Pauline and brother-in-law, Ray and niece Ann. Donations in her memory can be made to: The Senior Center of Jackson Hole or donate: a book to a library. There will be a Mass at Our Lady Mountain’s Catholic Church in Jackson, Wyoming on May 17th at 2pm with a reception following. Additional celebrations of her life will be held later in Bondurant.